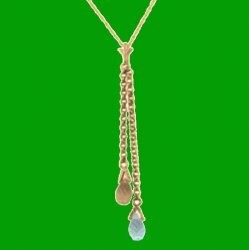 This lovely and beautiful Blue Topaz Citrine Briolette Long Drop Pendant is expertly crafted in 14K Rose Gold. A beautiful simple and elegant piece. Pretty, enjoy this Blue Topaz Citrine Briolette Pendant. Each pendant features One (1) Briolette Genuine Blue Topaz Gemstone measuring 6.00mm x 4.00mm and One (1) Briolette Genuine Citrine Gemstone measuring 6.00mm x 4.00mm. The pendant measuring 49.80mm (1.96 inches) x 8.10mm (0.32 inches). A 18.00 inch (45.75cm) 14K Gold Chain comes with this piece. The gold metal weight of this pendant is 1.30 grams. The stone weight of the Blue Topaz and Citrine is 1.40 carats.